Qadam Rasul [Qadam Sharif], the court of the Print of the Prophet's foot, Delhi. bl.uk > Online Gallery Home	> Online exhibitions	> Asia, Pacific and Africa Collections	> Qadam Rasul [Qadam Sharif], the court of the Print of the Prophet's foot, Delhi. Watercolour of Qadam Rasul or Qadam Sharif, the Court of the Print of the Prophet's Foot, Paharganj, Delhi showing figures seated in the courtyard. Inscribed on the front in Persian characters: 'Naqshah i dargah i qadam i sharif' (Picture of the shrine of the relic); on the back in English: '2. 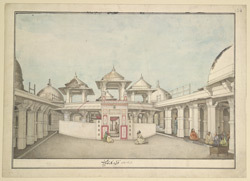 The Court of the Print of Prophet's Foot, Delhi.' It shows the 'dargah' or shrine of the Prophet's Footprint in modern-day New Delhi. The site dates back to the fourteenth century with a number of alterations and additions made during both the Sultanate and Mughal periods. It remains an important point of Muslim pilgrimage today, and is the venue for recitations, music, meditation and private devotion.